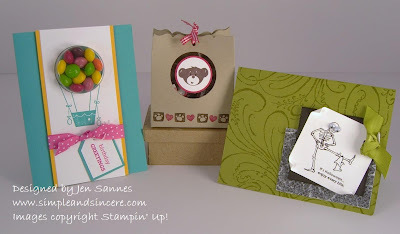 Simple & Sincere: Mother/Daughter Stamping is Back! 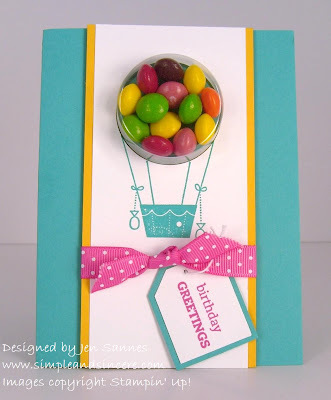 After a brief summer hiatus, our mother/daughter stamping class is back! We had a great turnout for our first class of the fall and here are the projects we made. And here you can get a close-up peek at each of our projects. It was my turn to prep for the class, and I decided to focus on items from the Holiday Mini. 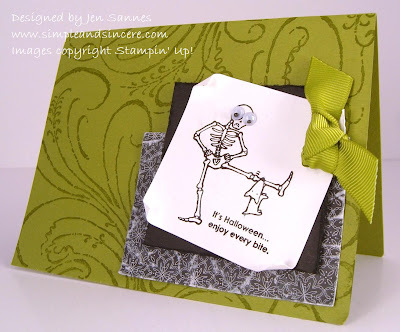 This card used the super-cute Halloween set Twick or Tweet and the Night & Day Specialty Paper. I came up with this little bag of goodies (made with the SU! Fancy Favor die) to show off some of the new Build-A-Bear stamps - we used Seal of Pawthenticity. We filled the bag with Tootsie Rolls - yum! That's all for today - I'm off to continue cleaning out the toy room. It was getting pretty scary in there, but I think one can actually walk more than two steps into the room and *maybe* even find a specific toy to play with. How long will it stay this way? I give it approximately 2 hours, if I'm lucky! LOL! Have a great day! Cute! 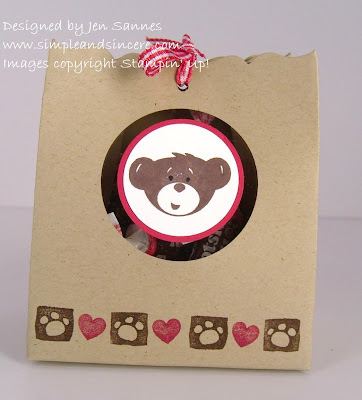 I love the bear treat/bag!